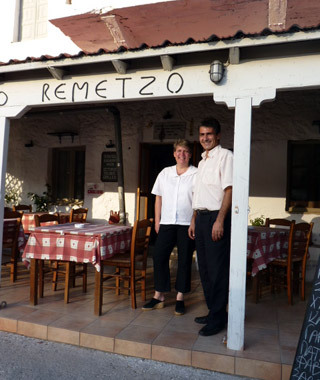 WELCOME to our Taverna "To Remetzo"
Tasos and Vibeke welcome you to their taverna, “To Remetzo”. Enjoy excellent Greek dishes prepared with the finest and freshest ingredients along the pier on the little harbour of Gerakas. Select from our menu which features local fresh seafood, meat dishes, salads, a variety of side dishes, and desserts. Whether for lunch or a romantic dinner, our friendly service and the backdrop of the harbour village of Gerakas make for a relaxing outing. The taverna is a short drive from Monemvasia with its fortified city, narrow lane-ways, medieval houses, churches and charming little shops. The region in general has many wonderful beaches, walks, historical sites, and quaint little villages. Tasos Korogonas and Vibeke Horst welcome you to 'TO REMETZO' and look forward to serving you. The taverna “To Remetzo” is located in the little harbour of Gerakas where it has been serving its customers since 1999 in an old village dwelling dating from 1870. Here, you can enjoy your meal next to the sea. The local fresh fish, the various side dishes all created by us using pure ingredients and home care, the excellent service and the beautiful surroundings will leave you with the best memories from your visit to the harbour village of Gerakas. To Remetzo is today a popular taverna , attracting visitors who drive or sail in from all over Greece and Europe. This was our first visit to Greece and we were always looking for something different. 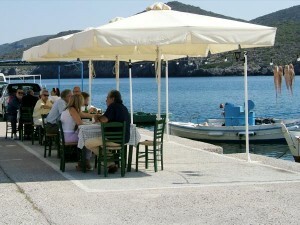 The harbor is very nice and out of the way and this little taverna was ideal place to have an evening dinner. The food was excellent and it was very romantic once the sun went down and we were there with the stars. Very nice people.